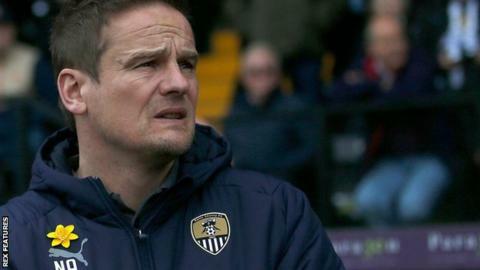 Notts County boss Neal Ardley says their status as the world's oldest professional football league club is weighing on their relegation fight. Notts moved off the bottom of League Two with Saturday's win at Stevenage. County, founded in 1862 and an original Football League member in 1888, have never dropped to non-league level. "We've got that extra burden of the title of this club that goes with it and the anxiety that comes with that and the pressure," Ardley said. The financially-troubled Magpies, who have lost just once in four games, are in the relegation spots on goal difference alone after the 3-0 victory at Broadhall Way. Ardley said supporters have not "appreciated" the form County have been in, with the Magpies manager talking particular offence at the jeers his players were subjected to following their recent 1-0 home defeat by 10-man Exeter. "We got booed off because the one mistake that cost us, and I thought that was harsh," Ardley told BBC Radio Nottingham. "The boys are giving it everything. Just get behind them because the last four games have been magnificent. "We need everyone on board to make this happen." While there has been a recent upturn in form for Notts, there remains significant off-field concerns at Meadow Lane. The club are due in court on 10 April after being issued a winding-up petition by HM Revenue and Customs, and they remain up for sale by Alan Hardy, whose interior design company recent went into administration. While Notts moved above Macclesfield in the table with six matches remaining, Sol Campbell's side are just one point adrift of the Magpies with a game in hand.